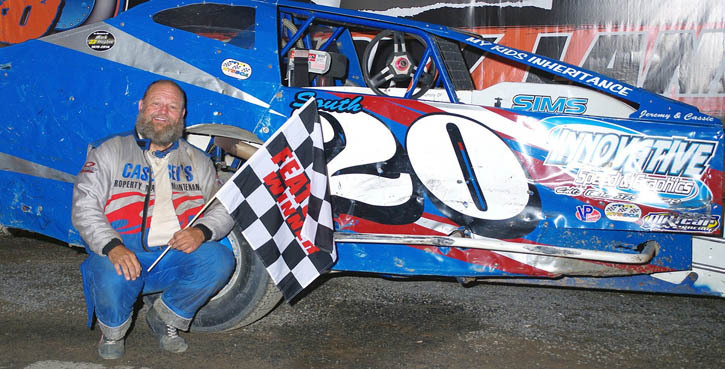 WEST HAVEN — Devil’s Bowl Speedway management confirmed the loss of one of its stock car racing family members, driver Ron Casey, in an official statement released Monday, July 4. Ron Casey, age 61 from Manchester Center, Vt., was competing in a NASCAR Whelen All-American Series Sportsman Modified race on the 3/10-mile Dirt Track at Devil’s Bowl Speedway in West Haven, Vt., on the evening of Sunday, July 3, 2016 when he was stricken with what appeared to be a medical emergency that led to a crash. With nine of 35 laps complete at approximately 9:15 p.m., Casey’s racecar suddenly veered off course through the infield at a high rate of speed and traveled through the infield grass before making a hard impact with a retaining wall in Turn 2 and coming to rest. No other people or vehicles were involved in the incident. Mr. Casey was quickly and carefully tended to by track safety workers and the Fair Haven Rescue medical team who were on site and at the scene within 60 seconds, the statement continued. Casey was extricated from the car and transported by ambulance to Rutland Regional Medical Center in Rutland, Vt., where he was officially pronounced deceased at 12:12 a.m. on Monday, July 4. The cause and manner of death are under investigation and pending the results of an autopsy, Trooper Erin Hodges from the Rutland wrote in the police report. Ron Casey used proper safety equipment including an approved helmet, head-and-neck restraint system, aluminum racing seat, and certified restraining belts, all of which were in good condition and met current safety specifications, according to Devil’s Bowl. The car was inspected following the crash and was deemed to be mechanically and structurally fit for competition. Visiting Hours: Friday, July 8, 6-8 p.m.
Graveside Services: Tuesday, July 12, 1 p.m.